I am determined not to spend money this weekend. All of my money is going towards truck repairs which is ok because I am terrible about my truck's maintenance and it is time that it got some attention. I wanted to go out to my property and get a large dog kennel to convert it into a quail cage but that would just encourage me to get more quail and that isn't a priority at this moment. I am perfectly happy with my 3 little quiet quail. While puttering in the yard, pulling weeds and tidying up, I started to think about the shade in front of my bedroom sliding glass door. 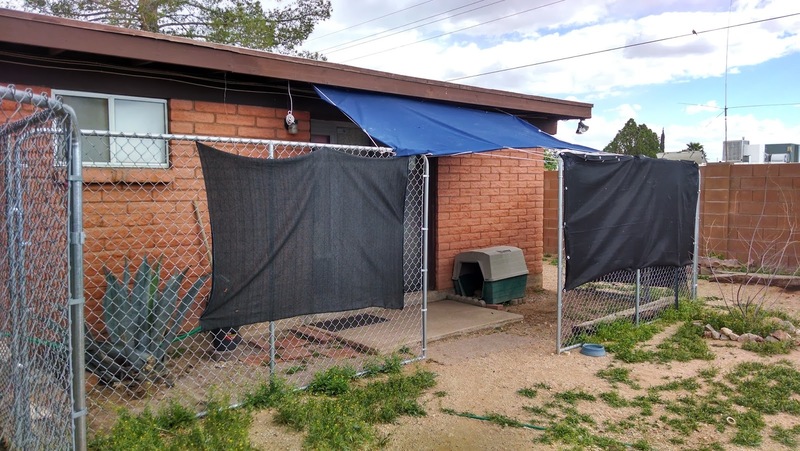 The first year I lived here I tried a large tarp to shade the glass from the sun and keep a rain-free area for the dogs. The tarp got a A+ for shade, D for wind, and F for rain. During our Summer downpours, the rain came off the roof and filled the tarp so that I had to go stab it so that it would drain. The wind eventually tore it to shreds. The next year, I bought shade cloth. It wasn't very dense shade cloth so it got a C+ for shade, an A+ for wind, and an F for rain. I thought about buying a small tarp, maybe 4'x6' to just cover the door area but since I am not spending any money I decided to think about what I could use that I already have. That's when I remembered the project that I started 2 years ago. I bought a 24'x5' piece of awning fabric and grommets and attempted to attach the grommets but had a lot of trouble so I gave up. I got the fabric and grommets out of the shed and started again. This time I figured out how to put the grommets on correctly and I used scissors to cut the holes instead of using the worthless little punch that was included. While I was working on it the wind picked up and tried to take the fabric away so I decided to cut it to 10' long to be more manageable. 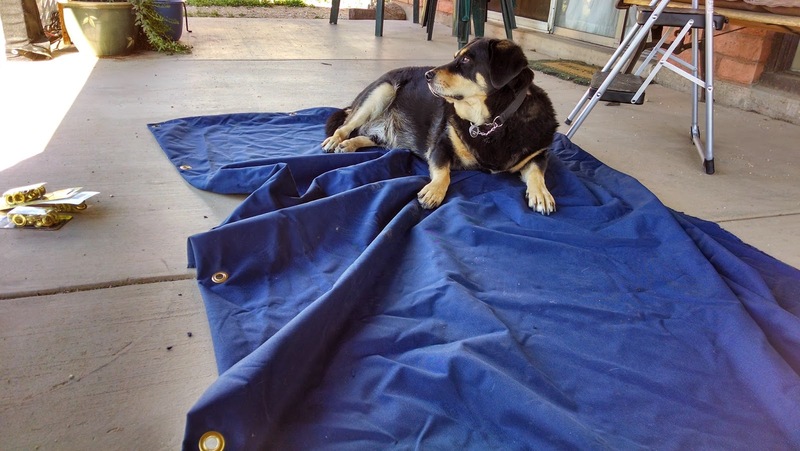 Here's one of my dogs helping to hold down the fabric. And here it is after I put it up. Now, bring on the wind and rain! I need to test this out while the weather is still cool. Trying to reconfigure shade cloth when it is over 100 outside is no fun at all. I am thrilled that I finally finished this project and that I didn't spend any money today. I have a bunch of other unfinished projects around here. I wish I had more time off. 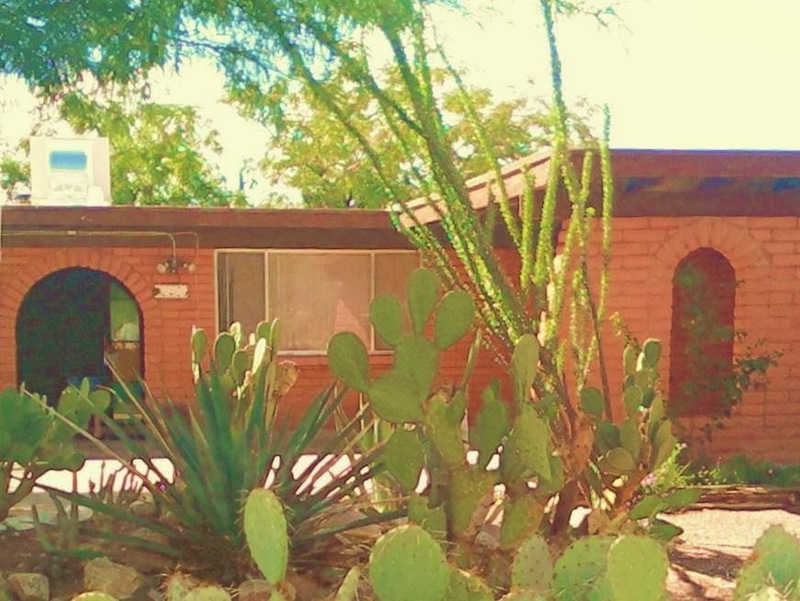 Oh, and yes, those are weeds but I like them because they are green and anything green in Arizona is rare. They will die off soon enough. I know what you mean, when you manage to do something with stuff you already had but had forgotten or not joined up the dots. Warm glow!! Yes! Especially since I usually go shopping for supplies and then I'm too tired to work on the project. I had no excuses not to finish it.